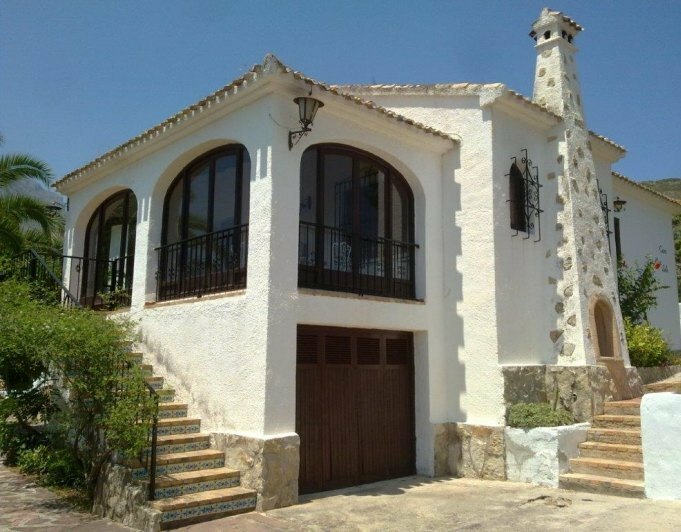 Wonderful project for an attractive modern property, in the fabulous tranquil area of Lomas de la Rey, Javea, bordering with the nature park. The design of this house is in harmony with its natural surroundings and qualities created for sustainable living. Located on a large plot of 1000m2 and construction of 200m2 plus terraces and patio, this property comprises of the following: Ground floor: Spacious and bright living room, with feature fireplace and huge wide windows to accentuate the panoramic views, open plan kitchen equipped with electrical appliances brand Balay with dining area, spacious master bedroom with en-suite bathroom with double sink, 2 other double bedrooms, a bathroom, toilet, laundry room, store room and garage (with access from the house and garden). First floor: An internal staircase leads to a second 21m2 sitting room, also ideal as a library, office or perhaps another bedroom, with access to a 35m2 terrace, giving beautiful views to the nature park. Outside: Magnificent design swimming pool, extensive terraced chill out area and beautiful landscaped garden with lawn. Tosca stone perimetre wall and 1.50m fence for a total height of 2m. Motorized vehicle entrance gate and pedestrian gate with electric opening by video intercom. El Arenal beach is approx. 3km and the promenade with its bars and fine dining restaurants. The port and old town of Javea 5 km and 9 hole Javea golf course approx. 3 km. Javea Bowls Club is just over 1km. The informative Building Specification is available in our office with extensive details of construction and qualities.